Good morning, friends. Excited to be posting my first recipe on the new site + a BIG thank you for your continued words of excitement & support. I’m so thrilled to know you’re loving the change in direction and content. As I’ve mentioned, I have so much great stuff planned for December / January. On that note, let’s dive in, yes? Say hello to the yummiest soup, ever. It was honestly so delicious and I love that it’s plant based as well - definitely my preferred way of eating and keeping our family healthy and happy. It was so quick & easy to prepare, surprisingly filling and I’m a big fan of cooking with coconut milk and ginger. Between the anti-inflammatory properties, gut health, high levels of calcium and the fact that it’s allergen-free, makes it a kitchen favourite in our home. It’s the perfect soup whether you’re serving lunch or dinner, and pairs perfectly with white wine, crunchy bread, sweet pup cuddles and cozy fireplace! ;) Read below for detailed instructions and be sure to let me know if you make it. I promise, you won’t be disappointed! 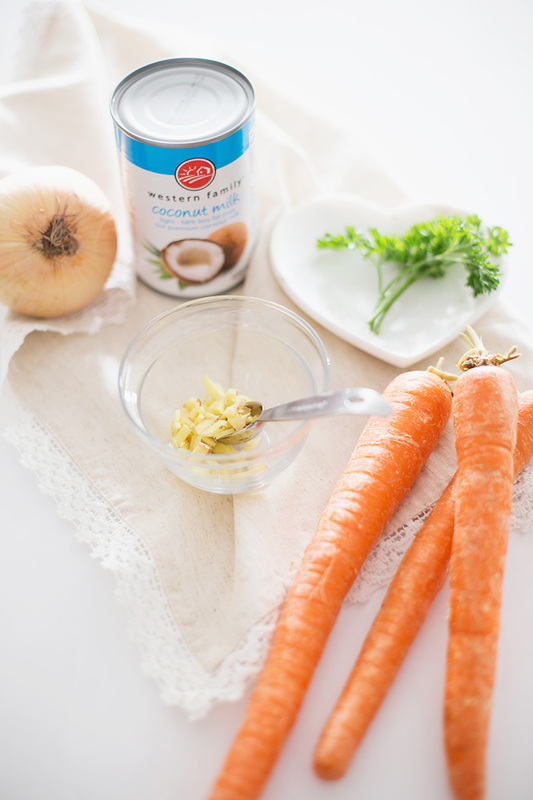 Add your ingredients: carrots, onion, ginger, coconut milk and curry powder to a soup pot and cover with vegetable broth. Simmer for 20 to 25 minutes until carrots are tender. Then set your soup aside to cool and puree in a blender (I did mine in two batches). Return to heat, salt to taste.